Tester: Hispanic (Cuban) early 40’s with dry skin, some hyperpigmentation and fine lines. 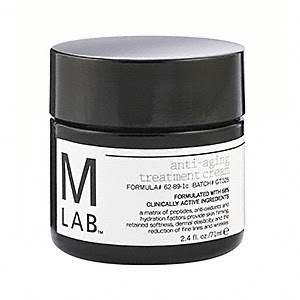 As I am a packaging junkie, I was a little surprised at M Lab's basic look, but after hearing so many stories about how great this line is, I quickly put that thought aside to concentrate on experiencing the product. The texture of this cream is not silky, firm; it’s thick/gelatinous, but not unpleasant. The cream started out on my skin slightly oily and then sank in quickly and felt light to the touch. The fragrance is a light, slightly green/grassy one. I applied the cream in the morning and evening, and after less than a week, my skin looked and felt more toned, some of my skin unevenness was already improving and most strikingly, my skin had that “glow”! As I continued to use it, I also applied it to my neck and paid close attention to my eye area as well. It is fairly concentrated, so not much was needed to cover both my face and neck areas. After several weeks of use, my face was significantly more moisturized throughout the day, and my fine lines were much less noticeable and the skin on my neck looked much better. This was also perfect for pre-flight hydration on several trips I took while testing it and I didn’t experience any skin irritation or clogged pores. This is a fantastic, modern anti-aging product that is best for dry/very dry skins and is definitely worth the luxury price tag.” T.V.